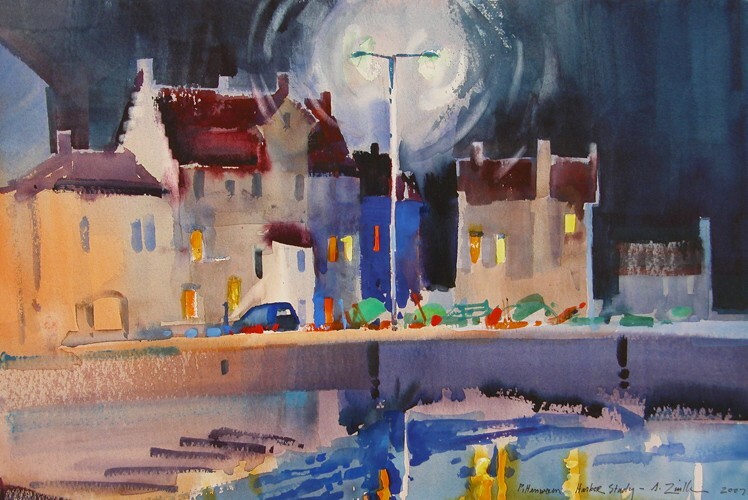 A few 2007 Scotland Paintings by Stephen Quiller are still available for purchase, and they are listed first. 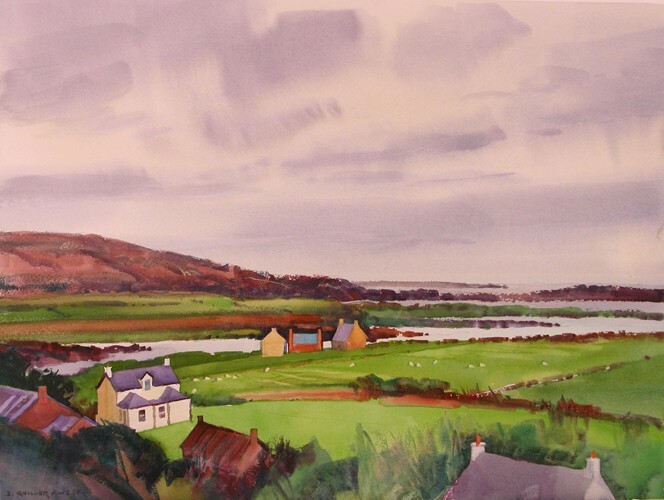 However, we welcome you to enjoy viewing all of the paintings, Stephen's introductory description to his Scotland painting tour, and his reflections on the inspiration for each painting. 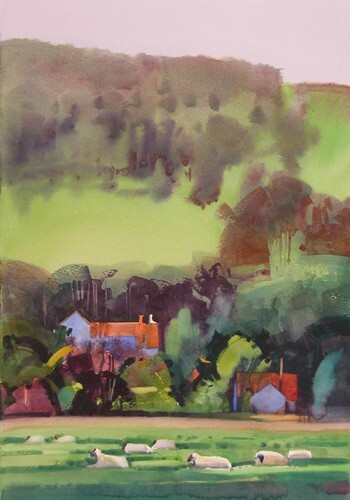 In late August of 2007 Marta and I traveled to Scotland, first to instruct a ten day "en plein air" painting workshop for the Jack Richeson Company that centered out of the central Highland village of Blair Atholl. Then we extended our stay exploring the fishing villages of the east coast Kingdom of Fife and later the west coast of Arisaig and Mallaig and the Isle of Skye. I painted daily on location with varied subject matter of the Scottish villages and countryside, harbors and boats, castles, flowers, lochs, sheep and heather-covered mountainsides. This exhibition opening February 16, 2008 shows the paintings done during this time. Although each painting was started on-site and taken approximately 85% toward the completion at that time, each painting was completed at the end of the travel back in my studio in Colorado. The people of Scotland are close to their place on earth, appreciative of their heritage, and love their daily lives and work. The country is wild, yet soft and wise. Light hangs in the evenings and there are many moods and colors. It can be dark and ominous, deep violet. It can be light and pastel, mystical and yellow. The landscape is diverse. 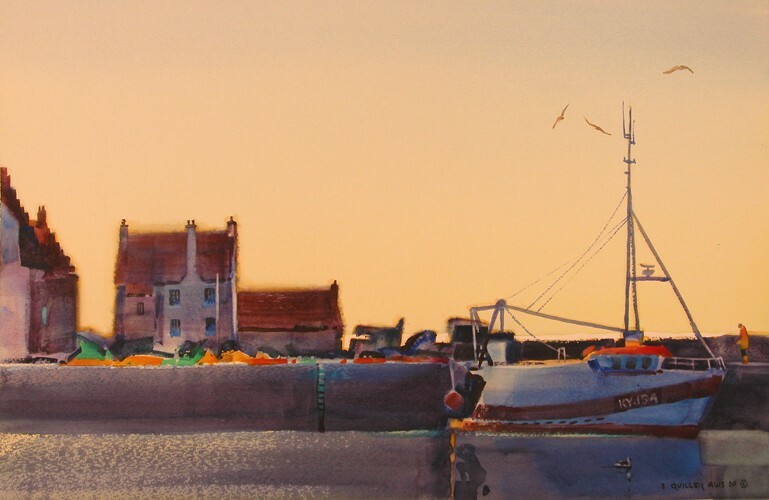 The eastern Kingdom of Fife is dotted with historic, working fishing villages. The people of these places are busy, out fishing mainly for crab, shrimp, and lobster, or are repairing their vessels and mending their nets. Their catch is taken on Tuesdays collectively to the west coast of Spain. Many villages have their own nine-hole golf courses, situated right on the coastline with creative layouts, and have tiny golf club buildings with “honor system” fee boxes. It is in this region, at St. Andrews, that the game of golf had its genesis centuries ago. The landscape of Fife is rolling, pastoral, and seemingly groomed. 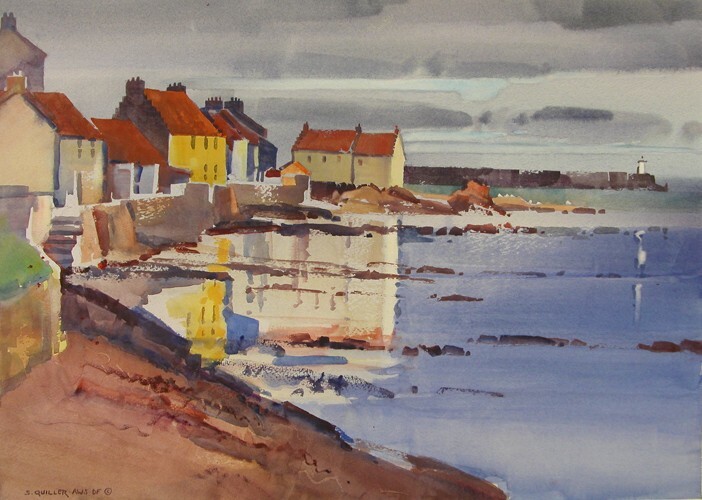 We stayed in a flat on the harbor in Pittenweem; nearby, within walking distance on a coastal path, were the villages of St. Monans, Anstruther, and Crail. 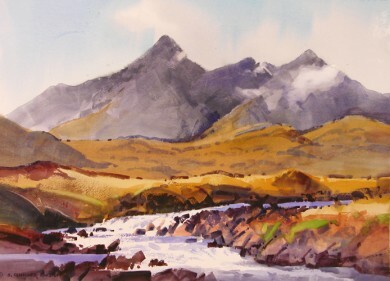 The Highlands are sometimes wild and isolated in the Cuillins Mountians, gushing with cascades and waterfalls and blanketed with heather, yet few trees. The areas around the lochs are lush and verdant, the hillsides and meadows dotted with sheep. The autumn color in this region is a mix of the violet heather changing to gold, the deep green bracken changing to rust. I did this piece in the wilds of the Scottish Highlands near Ben Lawers Park. 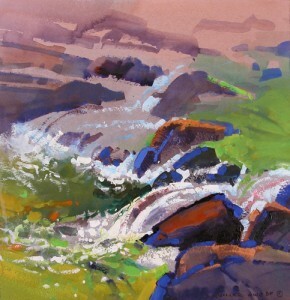 I imagined doing a thousand paintings here among the cascading waterfalls, aqua green pools, red rocks, and heather. I slid down the hillside, knee deep in heather, to get to my spot by the stream. It was open and unprotected and very windy. I did much of this painting on my knees to keep the board from flying away. I was most interested in the composition, the positioning and breakup of space. Glamis Castle, located in the southeast of Scotland, is the childhood home of the “Queen Mother” of Great Britain , who died at the age of 102 in 2002. There are long rolling green parks surrounding the castle, and outside the grounds is a beautiful small village. 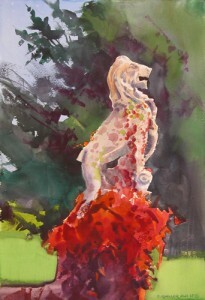 I chose to paint the ivy covered lion monument that was located in front of the castle. My inspiration came from the sunlight on the ancient sculpture contrasted against the strong color and texture of the ivy. Steve Willman and I began early one day at low tide in an area called “Two Summers” because of the brilliant weather and lack of wind in this south-facing part of the shore. I chose to focus on the sea and sand, and rocks along the sea wall. I needed to work fairly quickly to capture the composition before the tide shifted. We stayed in a self catering cottage by a beach near Arisaig. The first day was spectacular, and I painted on this beach with views of Eigg, Rum, and the Isle of Skye . 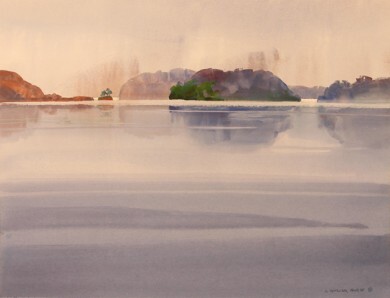 I worked in acrylic to capture the soft sky and the mountain views of the islands and the coast of the Atlantic . This is part of the beach that was used in the film “Local Hero” with Burt Lancaster. A few women in Mallaig said I should take some time to see Loch Morar, a lake about five miles from our cottage. This lake is the deepest in all of Europe, over 300 meters. I drove to this place and was blown away. It was moody and magical and unlike any lake I had ever seen. The water was still and the reflections long. The light was hitting the land forms, and clouds were moody, and the water stirred, reflecting the clouds. A few women in Mallaig said I should take some time to see Loch Morar, a lake about five miles from our cottage. This lake is the deepest in all of Europe, over 300 meters. I drove to this place and was blown away. It was moody and magical and unlike any place I had ever seen. The water was still and the reflections long. 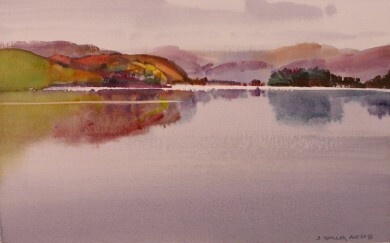 This is the last painting I did on the loch. It was a gray and moody day, and it called for casein. The air was so moist that the paint mingled and did many unexpected and exciting things. I worked by a boat dock and enjoyed being a spectator, watching the paint perform. I did this painting at the east edge of Blair Atholl village, beside a meadow. Light and shadow played down the hillside with a few Scottish cottages partially exposed through the trees. Black faced sheep, certainly symbolic of the Scottish Highlands, grazed in the field where I set up. In the Highlands there are remote single carriage roads with pullout passing places. 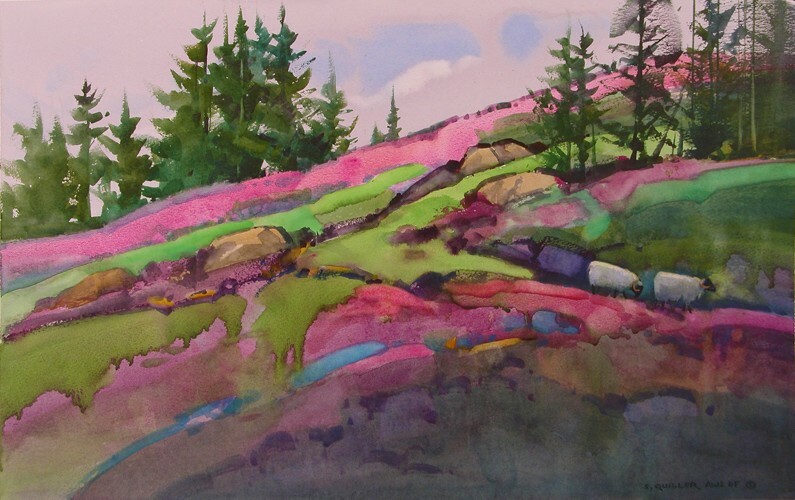 On one such road, over a mountain pass, I discovered a hillside covered with heather in full bloom. 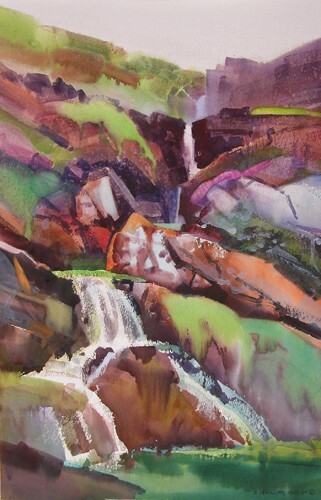 I went through a gate and stood knee deep in the heather and autumn bracken to do this piece. 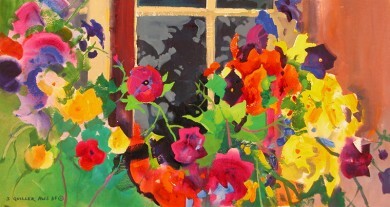 I did this painting of a hanging planter in the small Highland village of Kenmore. For me, one of the unexpected discoveries of Scotland was the wealth of gardens and flowers everywhere. I don’t believe I have ever been so inspired by the colors and shapes of plant life as I was all throughout Scotland. Adjacent to Blair Castle is a majestic ancient forest, cascading stream and an old stone arched bridge. I was inspired by the light, shadows, and texture of the stone bridge against the variety of green vegetation patterns surrounding the arched pathway. I discovered this flower garden in the back yard of a cottage in Blair Atholl. I studied the random colors and patterns many times during the first week of my time in this village, and finally had the opportunity to paint this subject. I chose acrylic for my painting medium because of its intense color and the variety of ways in which it can be applied. Our hotel had flower boxes in every lower window. 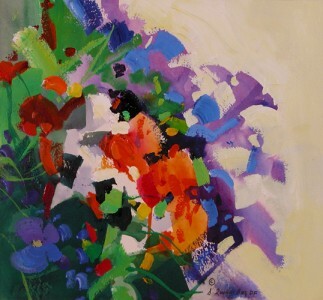 There were peonies and other flowers, yellow to orange, blue to violet. I wanted to paint these flowers from the moment we arrived. Finally, I set up in the parking lot to do this piece, using acrylic. The medium has brilliant color and can be applied in many diverse ways—thick to thin, opaque to transparent. An important part of this painting is the reflection of the flower patterns in the window. The Birks of Aberfeldy is a park managed by the Scottish National Trust. 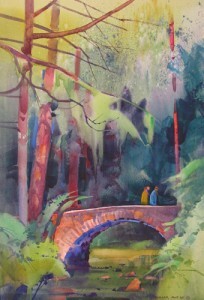 It is a wooded site, rather dark and damp, with cascading waterfalls. I set up on a sloping hillside in the forest and painted the rocks and water patterns, beginning with a transparent, neutral gray and built it up with opaque applications of acrylic. 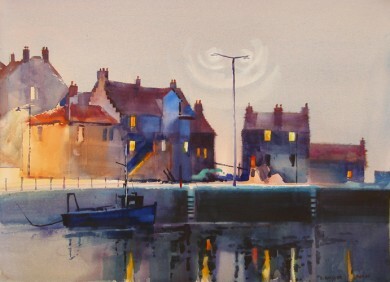 Pittenweem is a small fishing village located one hour northeast of Edinburgh in the Kingdom of Fife. Next to the small flat we rented on the harbor, I set about sketching, and did this study of the evening lights in some cottages called “The Gyles”, and the reflections in the harbor. 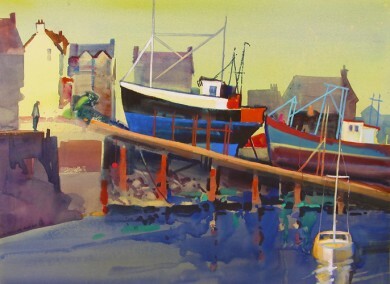 On the first full day in Pittenweem, I did this study. 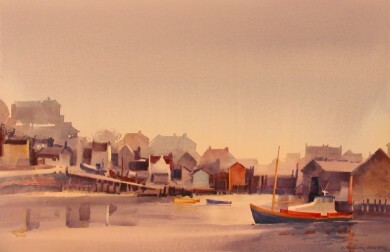 I set up on the harbor and referred to my sketch and color study I had done the evening before. While painting for the day, I had conversations with some of the local fishermen and the harbor master. They were all extremely kind and complimentary, making it a joy to work there. I spent the day painting in Crail, five miles from Pittenweem, with my friend and painter Lou Morton. We set up at the edge of the pier, not far from fishermen unloading catches of lobster. 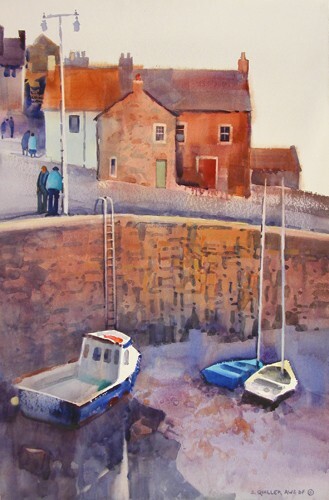 I was interested in the low tide, dry docked boats, the stone pier wall, and the red and ochre stone buildings in the upper part of the painting. People ambled down the street to the harbor from the village. 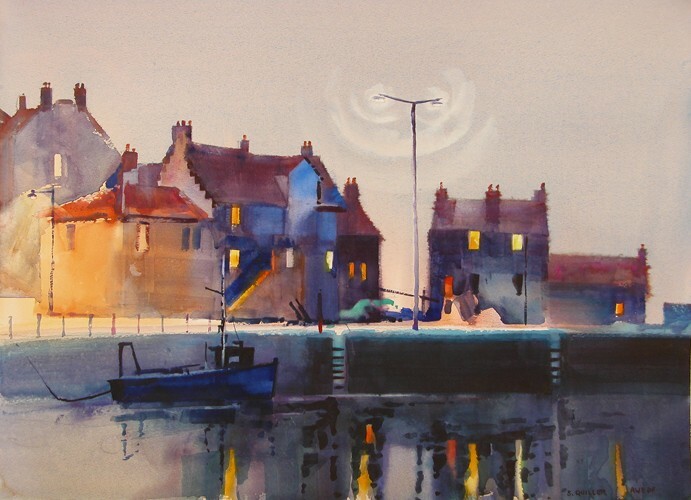 Pittenweem is located on a hillside sloping down to the harbor. There are a number of walkways connecting the upper part of the village and shops to the lower part of the harbor. There are a few vantage points overlooking the marvelous views of the rooftops, harbor and fishing vessels, and the sea beyond. I set up in one of these spots and did this piece in acrylic. 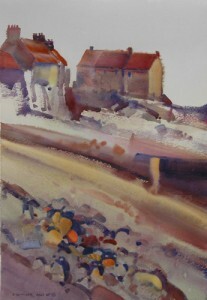 One morning I began my painting in misty and windy conditions. 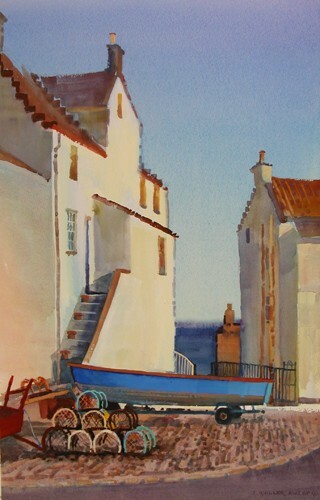 I started out at a point along the coast, outside of town, painting the sea, rocks, and a distant view of the village. However, I was quickly “blown away” and packed up my work. I relocated at a sheltered wall in the harbor, protected from the heavy wind. However, it began to rain. I set up an umbrella and worked throughout the day. The paper was so moist that the paint slowly crept down my paper. 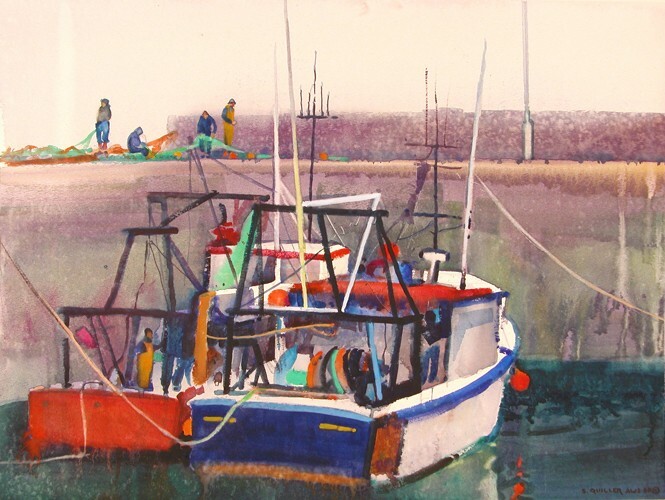 But I continued on, painting the boats and the fishermen mending nets. As the day continued fishermen unloaded their catch of lobster, crabs, and prawn. I was soaked and chilled to the bone when I quit that evening. The next morning I finished it. Kelly Castle is located about eight miles from Pittenweem. It is in the countryside of the Kingdom of Fife and is run by the National Trust of Scotland. I painted on a soft day with my friends Steve and Peggy Willman. 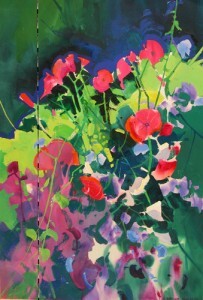 I had toured the gardens earlier with Marta and had visualized painting this patch of sweetpeas and lavatera. I chose acrylic as my medium because of the vivid color and variation of patterns. Kelly Castle is located about eight miles from Pittenweem. It is in the countryside of the Kingdom of Fife and is run by the National Trust of Scotland. I painted on a soft day with my friends Steve and Peggy Willman. 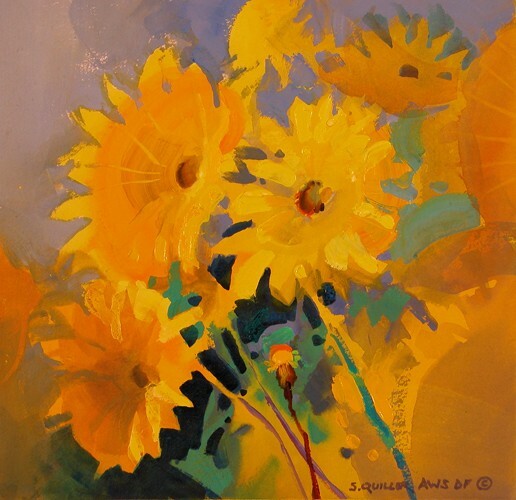 I had toured the gardens earlier with Marta and had visualized painting these sunflowers. I started this work by toning the paper with transparent yellow acrylic. I then carried on with this square format in translucent and opaque applications of the same medium. On a hike I had taken a few days earlier from St. Monans to Pittenweem on the coastal path, I came across this view and did a sketch. It was a partly cloudy afternoon at high tide. The water seemed purple blue, and the lighthouse, seagulls, and central cottage gleamed warm white. I liked the still reflections creating vertical patterns that broke up the composition of the piece. One brilliant still morning the light gleamed yellow-white off the ocean and harbor, and the back-lit Gyle Cottages were enveloped in light. I worked quickly to get the positioning and mood of this light and stayed with it, even as the sun rotated. Yellow and orange against the blue and violet was the theme of the day. I had noticed this subject and waited for a sunny day to claim it. I was interested in the white stucco wall shapes against the blue of the sky and boat, and the rhythm of the lobster pots. The cobblestone patterns and tiles repeat these shapes. While I worked an older man would come and go from his place on the harbor. 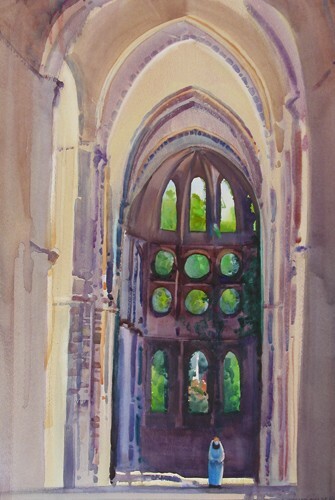 Marta and I flew to Belgium for one week, where I taught a workshop to European painters. For two days before the class we were free to explore. We spent Saturday viewing a Belgian paint mill, having a long elaborate lunch, and visiting a Belgian estate and garden. 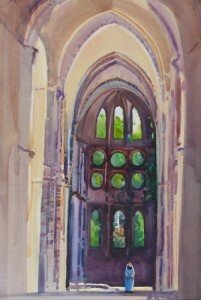 On Sunday I spent the day painting in an ancient monastery ruin. I had never painted a subject like this and I wanted to capture the texture and age, the immensity of it, and its spiritual presence. I was lost in it all day. 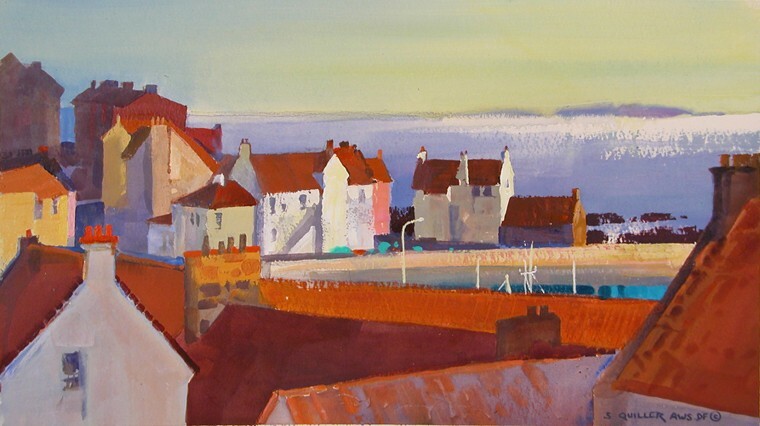 When we returned from Belgium to Edinburgh , we spent one more day at Pittenweem. 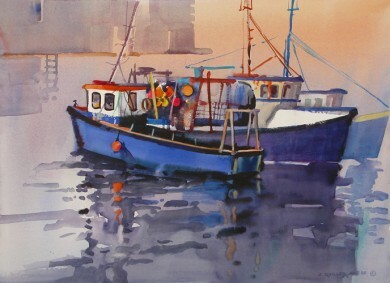 I did this loose composition of some boats in the harbor. The yellow and orange floats were important notes in this composition. I did this work on a quiet Sunday, with some fishermen working nearby. I did this piece on a cold, blustery day among the bracken and heather on a hillside overlooking the sea. I was inspired by the shape of the cottage at the lower left, the slight diagonal field patterns countering the diagonals of the sky, and the water patterns against the rocky coast. I was chilled to the bone by 1:00 p.m. and had soup, tea, and a scone at the local village. I returned that afternoon to carry the painting further. I took a day to do some small sheep paintings. These sheep were on a hillside by a single track lane. A few sheep were loose and meandering along the road. I treated this study very abstractly and freely. 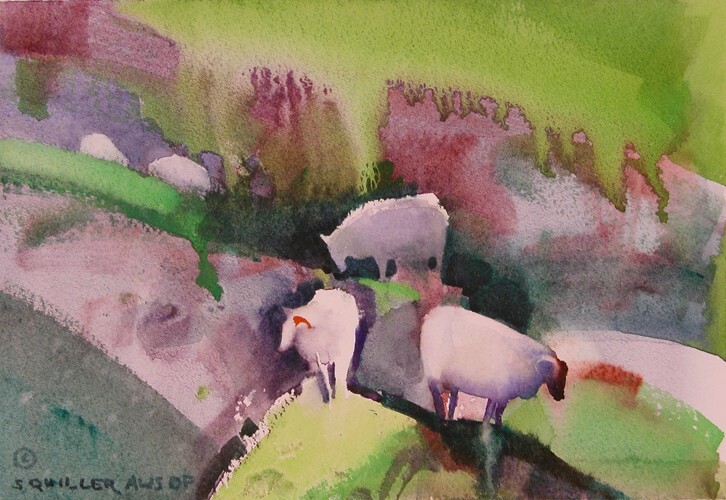 I took a day to do some small sheep paintings. 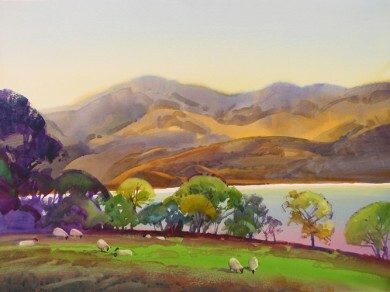 I did this piece close to a wild and scenic golf course and I included that rolling hillside and cows as well as the sheep. I took a day to do some small sheep paintings. I did this study from sketches I had done of the Arisaig church and hillside. I worked inside our cottage and worked in an extended vertical format. Mallaig harbor, not far from our cottage, is a short ferry ride to the Isle of Skye. Marta and I took our car over on the ferry and explored the beautiful countryside. The wild and majestic Cuillin Hills are central to the island, with cascading waterfalls and barren hillsides with heather and bracken. I found this site close to the highway with the characteristic view of the Cuillins in early October. 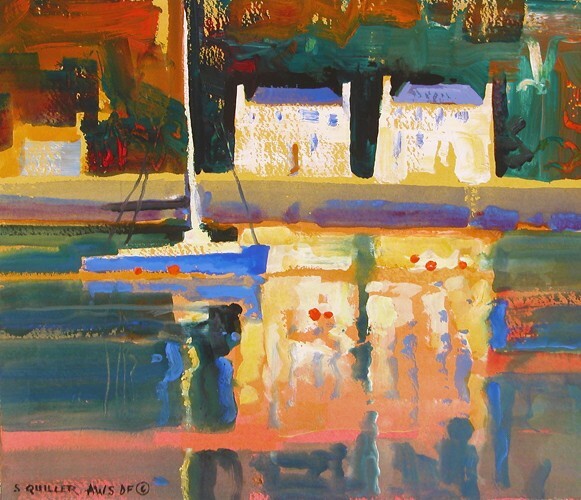 I did this painting on a sunny day on the side of the Mallaig Harbor with a view of the activity in the harbor. Two large vessels were dry docked and being worked on. They were linked to a diagonal rail and pulleys to raise and lower the boat into the water. In mid-afternoon the owner of one of the boats bicycled over to ask me how I was coming along on my painting. He stated that he did not want to disturb me but that he had been waiting for me to finish before he moved his boat! This story is just an example of how open and kind the Scottish people are. He wanted to “leave me in peace” and let me paint. In contrast to the brilliant, warm light evidenced in the painting "Dry Docked Boats", the next day was a gray, soft day when I did this piece. I set up further above the harbor and was interested in capturing the mist and gray atmosphere of the day. There was so much humidity in the air that I could work and manipulate the damp paint, seemingly forever. It was a magical experience. A few women in Mallaig said I should take some time to see Loch Morar, a lake about five miles from our cottage. This loch is the deepest in all of Europe, over 300 meters. I drove to this place and was blown away. It was moody and magical and unlike any lake I had ever seen. The water was still and the reflections long. This is the first of five pieces I did of this subject. A few women in Mallaig said I should take some time to see Loch Morar, a lake about five miles from our cottage. This lake is the deepest in all of Europe, over 300 meters. I drove to this place and was blown away. It was moody and magical and unlike any lake I had ever seen. The water was still and the reflections long. I did this work from a knoll by the side of the single track road. 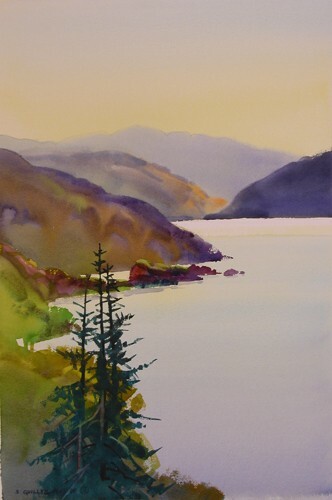 I was interested in the beautiful light on the mountains and water, and especially the vertical tree patterns which were statuesque in front of the lake. 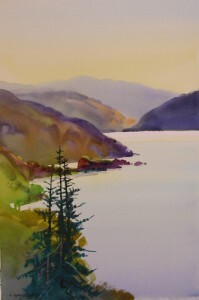 A few women in Mallaig said I should take some time to see Loch Morar, a lake about five miles from our cottage. This lake is the deepest in all of Europe, over 300 meters. I drove to this place and was blown away. It was moody and magical and unlike any lake I had ever seen. The water was still and the reflections long. I painted this piece at the end of the single track road. 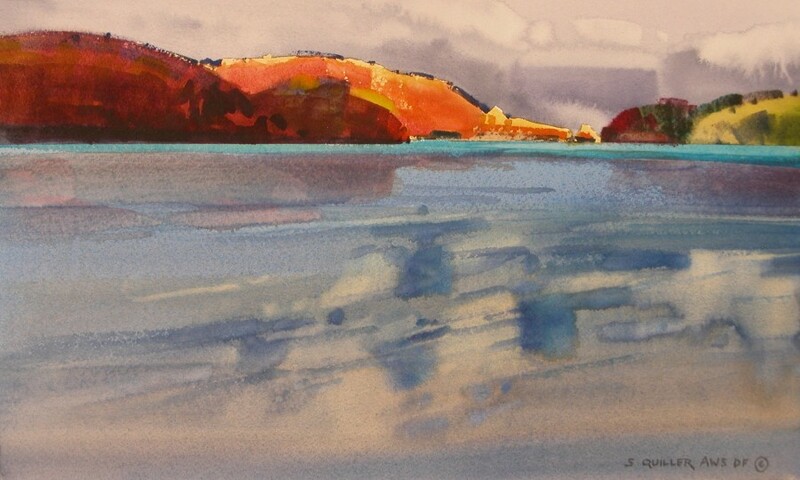 The light glistened off the water and I was interested in the beat of the color and tree patterns next to the water. Sheep meandered in the meadow. This definitely captures the light and mood I wanted. Marta and I rented a cottage on a hillside above the sea, and I could look out the picture windows and watch the various moods. At night, a fishing boat might anchor with lights glowing and stay for a while in the inky blackness. 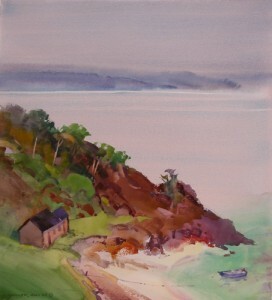 I did this painting on a soft day looking down on the stone cottage, bay and boat. One evening, Marta, Allie and I had dinner by the Mallaig Harbor . There was a beautiful orange-golden light and I vowed that on the next clear evening I would set up at the harbor and try to capture this impression. My last painting day was clear and I grabbed the opportunity. I toned the paper gold-orange with acrylic. I then worked rapidly in opaque casein. 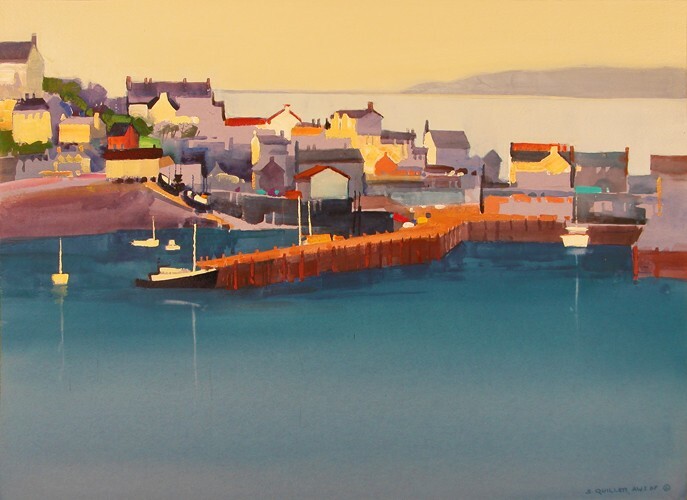 During our stay in Mallaig I wanted to paint this view of the harbor. It was a view from the back of the local fire station on a hill north of the village. On a clear, still morning I had the opportunity. I worked throughout the day, at times interacting with a few of the children from the community. They had a weekend holiday, and from time to time came to check on my progress. I chose acrylic because it is so versatile, and I could use it from transparent to opaque. I like the warm against the cool color, and the complex against the simplicity of the composition.